I was looking for a case for my EEE, which would offer more protection that the supplied slipcase, allow me to carry my power supply, hard drive and other small accessories, but without the bulk of a “full” laptop case. 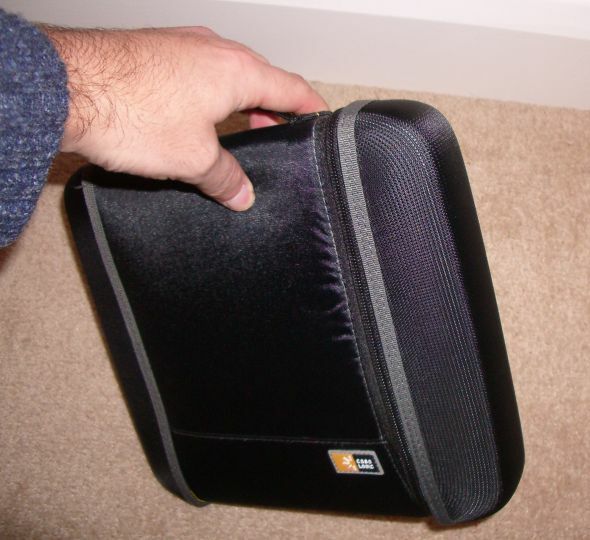 Case Logic’s hard drive case (HDC-1) caught my eye, and, through an Amazon Marketplace vendor for £13.50, I decided to give it a go, and see whether it would suit my needs for carrying my EEE or not. The case is nicely made, with a substantial feel to it. The external colouring of the case is quite understated, being a mixture of black and reasonably dark grey, with a variety of materials used in the construction. The inside of the case is a bright yellow colour, but, as this is hidden away for most of the time, this doesn’t bother me. The zip feels solid, and the ends are padded, in case you accidentally knock into something. The body of the case is made from reasonably thick material, but, the whole thing encourages me to trust it holding my EEE. The hand is small, but is also padded, so it is unlikely to cut into your hand too much. My preference would have been for a shoulder strap, but, perhaps the number of people who wish to carry their hard drives over their shoulder is limited; in any case, it would be possible to add a loop to the handle, to give me this capability, should I want to do so in the future. The inside of the case has a vertical divider, which is stitched on one side, and held in place by Velcro on the other. I’ve found that this divider is best kept “floating”, so do not bother to attach the Velcro; this approach didn’t seem satisfactory at first, but, with the amount that I want to carry in this case, it ended up being the only practical approach. So, what do I have in my case? It’s a bit of a tight fit, but not to the extent that I am worried about breaking, or even scratching, any of the items. For smaller items (in my case, the mouse and the Bluetooth dongle) there is a small, zippered compartment in the top of the case (the flap which opens), which would be suitable for storing memory cards and the like; I didn’t notice this at first, although, it is clearly visible in the photograph above. With all my kit in position (everything goes in the same place each time, and there is a packing order to get it in correctly), the zip fastens without a problem, but, the case does bulge slightly. Without the extra battery, this is significantly reduced, so, should be absolutely fine for most people. Overall, and notwithstanding the slightly bulging sides, I am very pleased with this case, as it means that I can have everything to do with my EEE in one place. The price was very reasonable (even after delivery at about £4.50), and I am now carrying me EEE around with me, with confidence that it will not come to harm, and with the advantage of all my accessories being in one place – I just need to remember to grab the one bag in the morning. The case appears to be available from PCWorld and the like, as well as online. This entry was posted on Saturday, December 29th, 2007 at 5:53 pm and is filed under Accessories, Reviews. You can follow any responses to this entry through the RSS 2.0 feed. You can leave a response, or trackback from your own site. I got one of these as well after reading other comments (from PCW – couldn’t wait & when P&P considered it wasn’t too much more). I agree it’s a good case and seems to offer reasonable protection to the Eee. I’m amazed at what you can cram in and will now go back to mine and get squeezing the stuff in! The PDVS-4 also works really well, and has the advantage of a separate pocket for the AC adapter and other loose stuff. 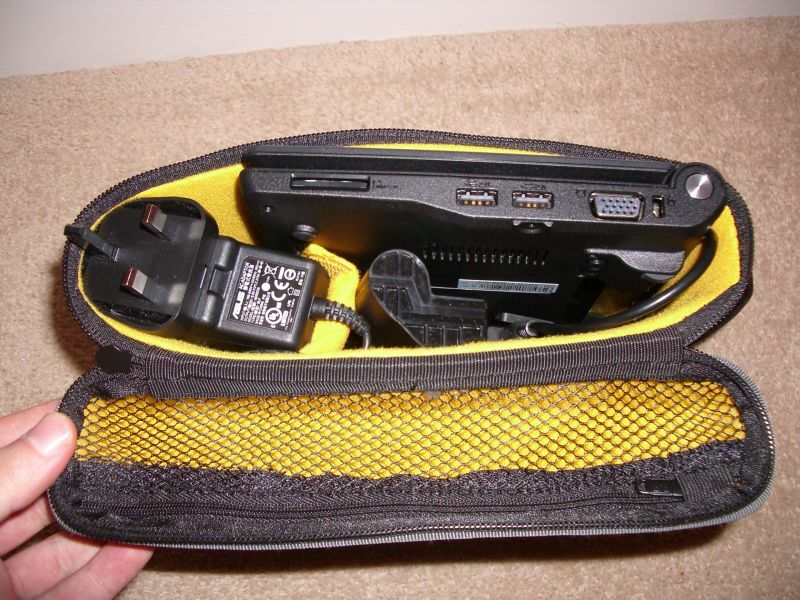 The aditional pocket even has a zip pouch inside for flash drives and SD cards. The PDVS-4 looks quite a bit larger, from the image posted? as this was recommended to me. It seem to be a little bigger than the one you have here. Also, where do you buy extra batteries for your Eee from? Actually the photo makes it look larger than it is. 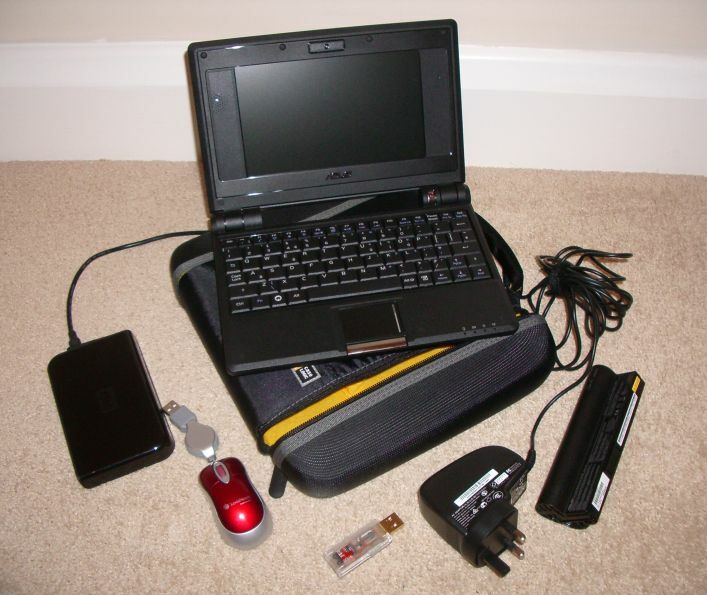 Here is a link to a photo of the case with the eeepc in it. It shows the two separate compartments, or rather, the main compartment and the front pocket where the accessories go. Note: since this is a case made to mount on the back of a car seat, as well as a carrying case, it does not come with a really good shoulder strap. The included straps are too long and don’t have a shoulder pad. I had to liberated a good strap from another case I have. Ed: Asus has announced an extra, extended battery, but, it’s not available yet. I was able to get a spare battery from someone who’d bricked their EEE’s motherboard, as was selling the parts on eBay. Actually the tag on the case said TDVS4…but a search of the CaseLogic site using that sku leads to the PDVS-4, which certainly appears to be the same case. I got the very last one from our local Walmart (having bought the same case for a 7in portable DVD player a month ago), and it is no longer listed on the Walmart on-line store. Check this bag out, it is perfect. http://www.amazon.co.uk/Hama-Universal-External-Drives-Black/dp/B000JIDNIO . 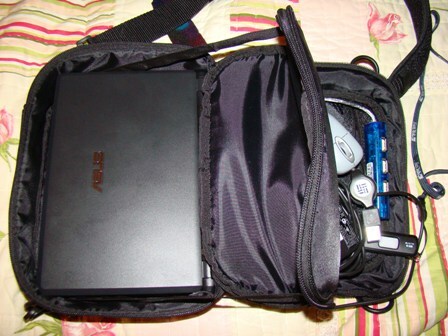 The power cable goes in the front pocket, space for laptop & spare battery etc inside. It’s a really nice case! Thank you for the post! I’m gonna buy it on Ebay for 14 euros….